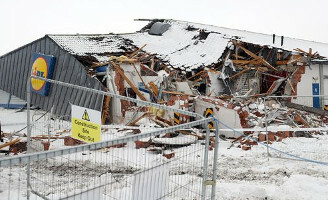 Looters in Dublin, Ireland appropriated a piece of construction equipment and removed structural material from a Lidl grocery store to achieve ingress and egress from the premises (archived). Reports out of Ireland and Airstrip One suggest a state of chaos amid routine winter weather self declared local authorities are apparently no longer capable of handling. This entry was posted in Africa, Europe, Government, Hardware, Ireland, News, Security, UK, Weather. Bookmark the permalink.